An observational technique first proposed more than four decades ago to measure the physical parameters of the corona that determine the formation of the solar wind — the source of disturbances in Earth's upper atmosphere — will be demonstrated for the first time next year. These parameters are the density, temperature, and speed of electrons in the corona. Nat Gopalswamy and Jeff Newmark, heliophysicists at NASA's Goddard Space Flight Center in Greenbelt, Maryland, plan to demonstrate BITSE — short for the Balloon-borne Investigation of Temperature and Speed of Electrons in the corona — aboard a high-altitude scientific balloon from Ft. Sumner, New Mexico, next fall. The scientific instrument on the BITSE mission, which also involves the Korea Astronomy and Space Science Institute, is a coronagraph. 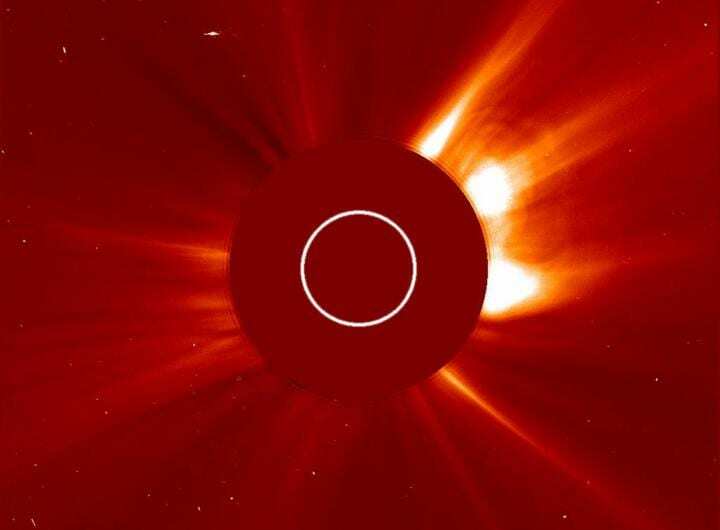 These devices block the Sun's bright surface to reveal its faint, but very hot upper atmosphere called the corona. However, the BITSE coronagraph has added features that can measure some very important properties of the solar wind, which can travel as fast as a million miles per hour as it flows off the Sun carrying charged particles or plasma and embedded magnetic fields outward across the solar system. Although scientists know that the solar wind originates in the corona, they don't know precisely how it forms or accelerates. "This flight will mark the first time we've flown a coronagraph to detect the density, temperature and speed of electrons in the corona. No coronagraph has ever done this before," said Gopalswamy, who used Goddard's Internal Research and Development program funding to advance BITSE. According to him, previously flown coronagraphs measured only the density of electrons in the Sun's corona. "We need all three physical properties to understand how solar wind forms," he said. This question is of particular importance to scientists. Understanding the source of the solar wind, which determines how space weather-causing coronal mass ejections, or CMEs, propagate between the Sun and Earth, can help improve space-weather forecasts, particularly in the near-Earth environment where changes can sometimes interfere with radio communications or GPS. During particularly strong geomagnetic storms, sparked by the release of tons of charged particles during a CME, particles that make up the solar wind can flow along magnetic fields through Earth's protective magnetosphere onto the surface where they can disrupt power grids and electronics. During its sojourn 25 miles above Earth's surface, BITSE will spend up to 10 hours imaging the Sun's corona. In addition to an occulter that blocks light from the Sun's surface — much like how the Moon blocks the bright light during a solar eclipse — BITSE carries two other important technologies. The filter wheel blocks all wavelengths of visible light except for those in four specific bands in the violet range — 3850, 3987, 4100, and 4233 Angstroms. And the camera, which serves as BITSE's detector, is able to directly collect polarized light — that is, light where the electric and magnetic fields oscillate in specific directions. Scientists need the polarized light to derive the electron properties. Because the camera can collect polarized light, BITSE doesn't require an extra mechanism to carry out the same task as do more traditional detectors. It works like this: "The visible light we're seeing is actually light from the Sun's disk that scatters from the electrons in the solar wind," Newmark explained. "This scattering smears out the light from the disk, which is actually lots of individual spectral lines or wavelengths. If we choose the right wavelengths to look at, then the amount of smearing tells us the temperature and speed the electrons must exhibit to smear the light in that way." "Anyone can make a filter wheel tuned to four individual visible wavelengths, but we put this technology together to make our instrument do what we want it to do. It's cool. It's the first time we've done this," Newmark added. However, the team hopes the balloon mission won't be the last hurrah for the coronagraph. "We really want to put a version of this instrument on the International Space Station," Newmark said. The team's methodical approach, from the first field campaign observing the solar eclipse in 2017 to the balloon fight in 2019, paves the way for a longer-term mission in low-Earth orbit, Newmark said. "We can fly the instrument for six months on the station," Gopalswamy added. "Literally, we're going from minutes, to hours, to months gathering these much-needed solar wind parameters that will feed into our space-weather models."